These beautiful apricots make a stunning focal point on the dinner table. This unusual, delicate sweet has some traditional Christmas ingredients: fruit, spice and maple syrup. 1. Drain the apricots and allow these to dry. 2. Dry fry the almonds in a thick-based pan. Set aside and allow this to cool. 3. Very finely chop the prunes and mix together with the desiccated coconut, cinnamon and maple syrup. 4. 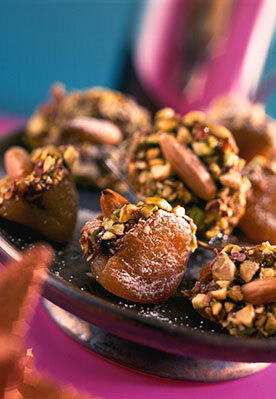 Carefully spoon the mixture into the opening of each apricot and then gently stuff with an almond. 5. Dip the open end of the apricot into the chopped pistachios and continue until all the apricots are filled. 6. Serve on a plate with Turkish black coffee. Recipe created by Chico Francesco for the Cordon Vert Cookery School.